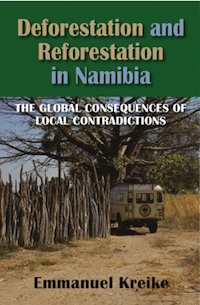 Colonial rule, the capitalist market, and population growth contributed to dramatic environmental changes in twentieth-century north-central Namibia. Moreover, as discussed in Jared Diamond’s acclaimed bestseller Guns, Germs, and Steel, biological invasions and modern technology paved the way for colonial rule, the market economy, and globalization. But unlike the linear narratives offered by Diamond and others, the directions of change and its outcomes were often unexpected, ambiguous, and contradictory. In north-central Namibia, for example, the late 1890s rinderpest microbe decimated indigenous herds but did not interfere with the cattle-for-guns export trade that was critical to sustaining anticolonial resistance. And although the region’s inhabitants rapidly embraced firearms technology more than a quarter century before World War I, they rejected plows and other new iron technology until well after World War II. Violence and insecurity affected where people and their animals concentrated and how they used environmental resources: the 1920s and 1930s were characterized by massive deforestation as refugees carved out new villages in wilderness woodlands and constructed fortified homesteads defended by elaborate palisades and fences. Yet, a vicious cycle of overpopulation, deforestation, and desertification did not materialize, as reforestation in the form of huge fruit trees paradoxically accompanied deforestation. Since the early 1960s, the exact causes and consequences of deforestation have been hotly debated by experts, policy makers, and CEOs alike. The prevailing literature focuses predominantly on evaluating environmental change against a baseline (e.g., Nature) to assess whether the outcome is environmentally neutral or whether it constitutes environmental degradation or improvement. Emmanuel Kreike, however, shows us that the case of north-central Namibia demonstrates that environmental change results in different and often contradictory outcomes that cannot simply be explained away as alternative readings or misreadings of the same process. His conclusions pertain not only to north-central Namibia but also elsewhere in Africa and beyond.